Drain Vitality is a common Agility action card. It is part of the Heroes of Skyrim expansion. In addition to the card's availability in the Heroes of Skyrim expansion, three copies are included in the Paarthurnax's Roar theme deck. The card's ability applies the Vitality Drained card effect. The card previously gave all enemy creatures in play -2/-2, but was nerfed in patch 1.72.4. 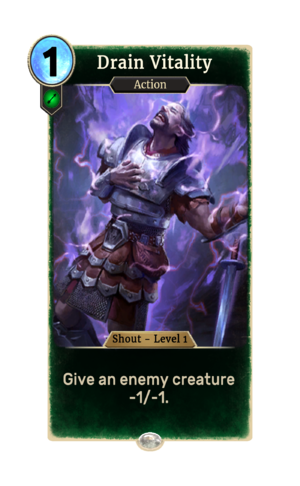 The card is based on Drain Vitality, a shout which first appeared in Skyrim's Dawnguard add-on. This page was last modified on 28 October 2018, at 05:56.